Greetings from sunny St. Barth where I’m settled in for the season and already busy with villa inspections, meeting with our hotel partners, and of course, sampling the new restaurants’ menus! I’ll be happily on-site until mid-May working with our staff to make sure everyone has a Dream Vacation. I hope you enjoyed the holidays with family and friends and that your New Year’s resolutions include taking a St. Barth vacation. Why not bring your family along and make some memories. Visit our new website to see our Family Villa Collection for some terrific options, and book soon for the February and March school breaks. You can still find us at www.stbarth.com, but we have a whole new look, updated resources and gorgeous images. Let us know what you think. Happy New Year! We hope to see you on the island in 2015. We are pleased to welcome Villa Why Not to our portfolio. Hillside in St. Jean, this striking five bedroom villa offers panoramic views over the bay, a wealth of outdoor dining space and a special connection for wine lovers. The modern design and décor are complemented with a uniquely framed collection of wine label posters; a double-size, temperature-controlled wine cellar discretely separates the kitchen from the indoor living areas. The kitchen is sleekly designed for a professional chef to easily prepare a gourmet feast for a crowd. A spectacular, extra-long heated swimming pool is the focal point of the outdoor space which includes a room-sized gazebo. The five en suite (French king) bedrooms are located on three levels and include two master suites and a spacious lower level bedroom ideal for teens or a nanny. You could bring your extended family or your best oenophile friends. Why Not, indeed. Valentine’s Day is Saturday, February 14, and that’s right around the corner. Book a warm & sunny getaway for you and your special someone. We have curated a listing of our most romantic villas. Take a peek and then chat with Anne, Julie or Kathy. They would be delighted to book a villa that you are sure to love! Villa Noé is included in the Romantic Collection and at the top of all our lovey-dovey lists. Located on Toiny’s Brittany-like rocky coast, Noé is an architectural gem that exudes luxury and offers a wealth of amenities. Its striking modern design is complemented by a chic minimalist décor and a soothing white-on-white color palette. A gorgeous infinity pool is the focal point of a spacious terrace with a unique cabana for cuddling in the shade and dining alfresco. Add in spectacular views of St. Kitts and Nevis, trade winds and the sound of the surf. Ooh la la! We recommend booking a private chef for a dinner under the stars and, of course, a bottle of bubbly. There are two en suite bedrooms with king beds, ocean views and access to the pool terrace. The price in season, including over Valentine’s Day, for a week’s rental using just one of the bedrooms is $8,320.00. Special Offer: Book Villa Noé by February 14 for a stay between now and April 15 and we’ll pick up the 5% tax for you. * That works out to about $400, and our concierge team will have loads of suggestions to utilize that savings to enhance the romance quotient: perhaps a couple’s massage or a special dinner at one of the island’s fabulous restaurants. *Valid on new bookings made between January 20 and February 14, 2015. Le Guanahani – We are pleased to share that our hotel partner Hotel Guanahani & Spa has completed its four-year, 40 million dollar renovation and opened the season rebranded as Le Guanahani. The lobby has been artfully reimagined, and the Caribbean-hued cottages have been refurbished. We particularly love the timeless Explorer-style décor. Le Guanahani’s vision is to enhance the experiential nature for those who stay with them: Guests can take guided walks along the property’s hiking paths (a protected nature reserve), and 2015 will see the launch of bi-annual wellness retreats led by experts from the U.S. and France. Experiences include an Atlantic deep-sea fishing trip with a seventh-generation St. Barth fisherman combined with a chef-prepared meal as part of a three-course tasting lunch or a five-course dinner. Details for Cook Your Catch are on our website under the Activities & Amenities tab. We are pleased to be included in Travel + Leisure’s 2015 Guide to Villa Rental Agencies. The piece provides some great tips for renting a villa and lists the best agencies, geographically. For St. Barth, it’s St. Barth Properties! L’Avventura. The owners of Gustavia’s (former) fish resto Ocean have reinvented and renamed the space and fare. The concept is now wood-fired Italian cuisine. The pizzeria-plus serves up pasta dishes, grilled meat and fish and some rotisserie items. The space remains charming and cozy with banquette seating and a neighborhood ambiance. Prices are reasonable, and it’s a nice choice for more casual dining. New this season, harborside L’Escale d’Avriette (La Pointe side) is already getting kudos. Operated by a St. Barth family and named after their mother, Avriette, it specializes in Créole cuisine. The menu often includes the delicious dish Gratin de Christophine with langouste. The tropical squash’s flesh (steamed) is scooped out and mixed with veggies and the langouste refilled, topped with cheese and grilled. Yum. Let us know what you think. 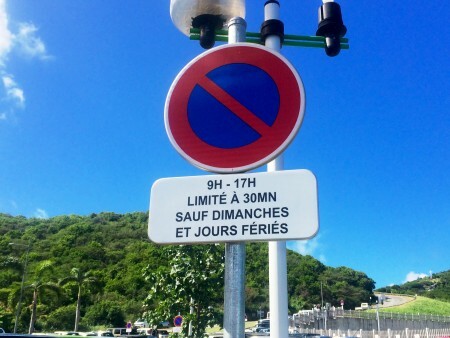 St. Barth has its first pay parking lot, but the good news is that the first hour is free. The Collectivité bought the lot across the street from the airport and opened it in conjunction with the airport’s new parking restrictions: 30 minutes maximum Monday-Saturday between 9:00 AM and 5:00 PM. For a quick parking “tutorial” on additional restrictions and the Blue Disk, see Peg’s Blog and subscribe for all the latest news. February 17 & 18 ~ Carnival – St. Barth does Mardi Gras: parades and fun. March 19-22 ~ St. Barth Bucket – A three-day regatta featuring the world’s largest and most prestigious yachts. April 13-18 ~ Les Voiles de St. Barth – Sailboats, ranging from classic to mega yachts and their crews- arrive from around the world for a series of regattas and events culminating in a display of fireworks. Harborside – literally – in Gustavia, this luxurious and unique two bedroom apartment offers a chic and charming house-boat-style experience. The covered outdoor terrace is perfect for waterfront lounging and dining. Indoors, there is a compact kitchen and a comfortable, air-conditioned living and dining area. The master bedroom is above the “living quarters” and features a walk-in closet and an office area. The 2nd bedroom is at water level its en suite bath has a sink and shower. The toilet is on the mezzanine level as required for this type of waterfront property. An easy walk to Shell Beach and the shops and boutiques. What a view! OMG! I realize that there are many villas with views but, really, this one would be hard to beat. We love everything about it. The size is perfect for us. We are so thankful we stayed with St. Barth Properties. Your suggestion of Diaco for this special anniversary is an example of what you and your agency do for your clients. Merci beaucoup.